Join us on Saturday, April 27th from 10 AM until 3 PM to explore four highlights of Albuquerque’s mid-century modern design up close and interior. Four local homeowners have graciously agreed to open up their homes to you to explore at your own pace. These homes were carefully selected to represent Albuquerque’s mid-century era and are situated in neighborhoods alongside other exemplary mid-century properties. From inspired, architect-designed homes to another built by a savvy merchant builder selling a stylish slab of the American Dream, the ABQ Mid Mod Home Tour will showcase a snapshot of modern Albuquerque too often ignored. We’re also excited to feature a fifth location just for you, an iconic property and community fixture that will serve as our check-in location. Details about the check-in location will be provided in an email to all ticketed attendees the week of the event. The addresses of the homes on tour will only be distributed on the day of the event at check-in to ticketed attendees. 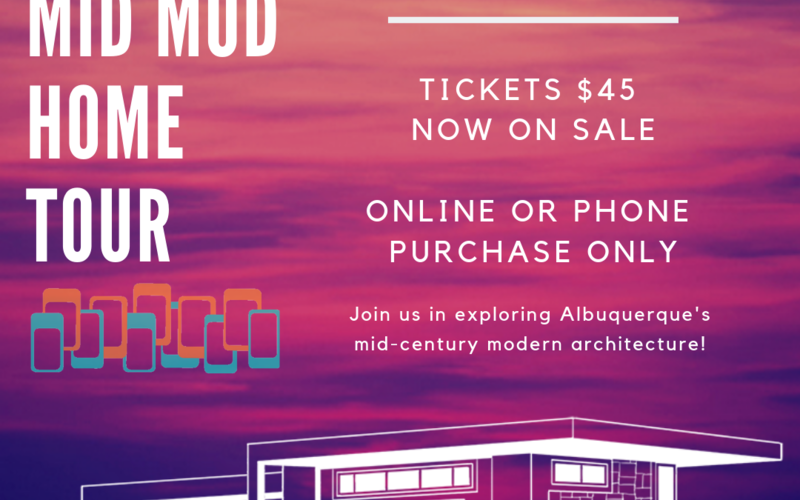 Tickets are $45 per person and support Modern Albuquerque’s efforts to document and popularize Albuquerque’s mid-century modern architecture. Our newsletter, Instagram page, and ongoing research efforts are fully funded by tours and events. Revenue generated through these outlets allows us to expand our knowledge and share Albuquerque’s modern design and mid-century history with you. Ticket holders will also receive a buy-one-get-one promotional code for a Hairpin Legs walking tour, another way you can learn even more about mid-century modern architecture in Albuquerque. We expect this event to sell out; please consider purchasing your ticket while they are available. For more information, visit our frequently asked questions. The ABQ Mid Mod Home Tour is organized in partnership with Ted Janka of CHED Designs, mid-century interior designers and retailers at Albuquerque’s Antique Specialty Mall, through the support of Albuquerque real estate company, Talia Freedman and Co. and assistance of communications consultant Alexis Tappan.